I have enjoyed some wonderfully inspiring and often very magical circles of people over the years. 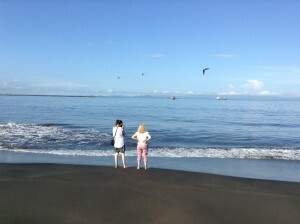 Two from my Costa Rican experience over recent weeks will go down in my diary as outstanding. Let me share them with you now. We left at 6 am sharp. Th e traffic was already building up along the main Highway. Apparently this was a public holiday and everyone was heading for the coast. Already getting warm we three Brits in the back of the car much preferred the air from outside, even though it contained a few fumes, than the chilly air conditioning. Glorious lush greenery danced at the sides of the road against the backdrop of a distant mountain range and bright blue early morning sky. 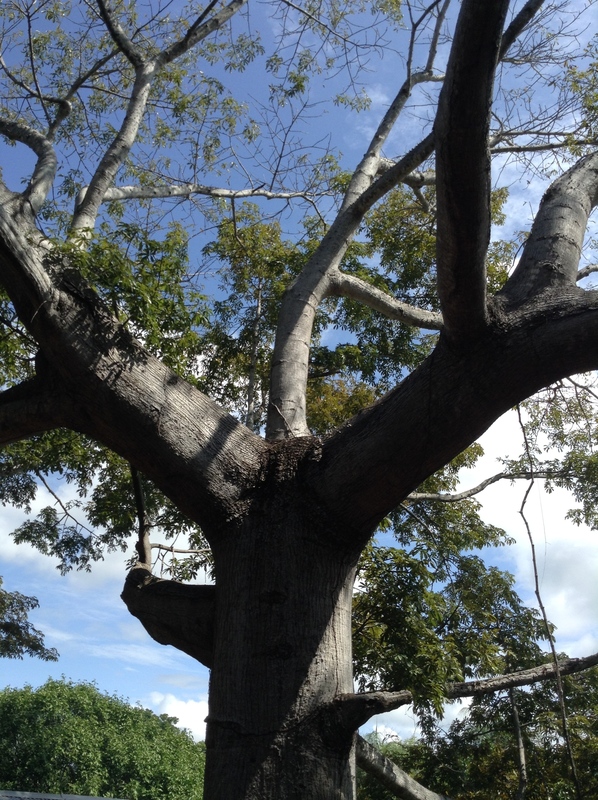 We were heading to a Finca in the rainforest owned by a well respected environmentalist and expert on medicinal herbs, Rodrigo Crespo, and the promise of a fire ceremony by the great Ceibo tree, held in high esteem as the sacred tree of the ancient Mayan people. A quick toe-dip in the Pacific en route gave me chance to take more photos, this time of Pelicans, (one day I will take a photography course and do the job properly). At the entrance to th e Finca we jumped at the loud growl of howler monkeys way up in the tree tops but advised, with a wry smile, not to stop too long to take pictures in case we became targets for marking territory! Thankfully we were not seen as too much of a threat, and avoided being unceremoniously peed on. The great tree was magnificent. Each of us took turns to engage with the energy of its ancient aura until one by one we took our places around the out edge of the fire circle. Our celebrant, an honoured representative of the ingenious Indian people of Costa Rica, Leila, stepped forward and said a prayer in her native tongue. Then in Spanish continued to greet the Madre Tierra and Padre Celestiel (Mother Earth and Father of the Heavens). A tingle ran through me as I resonated with this connection with the Essene teachings, recognising that the Ancient Wisdoms are universal. Then she invited the great powers of the elements and of the four directions. I loved that too and invited the power of the archangels in my head at the same time. As she approached the fire she honoured it with a gift of tobacco and Macuna leaves and announced her intention and dreams. Each of us moved around the circle and approached the fire offering the leaves and our own prayer, intentions and wishes. At each of the four directions Leila offered a different gift (such as a splash of water or sprinkle of soil) and said further words, which although I didn’t fully understand I could feel and resonate with the energy,while the rest of us simply moved around to the entrance of the fire. It was moving experience of intensity…. passion, respect, intention, and heat. 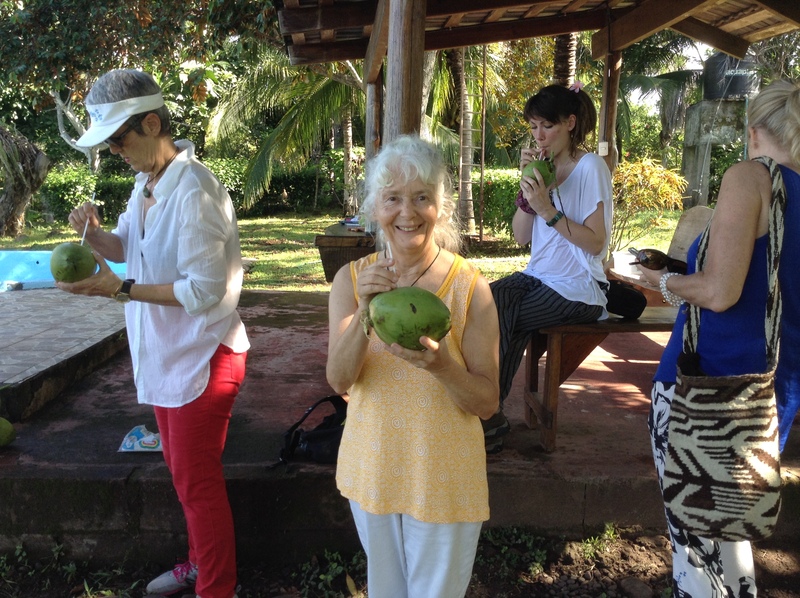 The next circle followed a tro pical lunch including pumpkin, roasted Palm hearts and coconut water straight from fruit freshly cut from the trees. Some of us attempted to slice open the coconuts but the only way was to wield a machete, and I wasn’t too good at that. We sat in a circle on a platform of decking, around an alter created on beautifully decorated cloth spread with feathers, tobacco, crystals, cacao leaves and more macuna. Macuna is a type of leaf which, when smoked, has relaxing properties. Our young and very beautiful celebrant sang a song to us about walking with beauty. It’s a north American Indian song which I’ve heard before during a walking a meditation, a long time ago. Then she explained in both Spanish and English that she had just taken part in a sacred tobacco ceremony in Colombia and had been entrusted to carry on the sacred tradition in Costa Rica. I will share with you the secrets and you’ll see the difference between smoking a cigar and honouring the sacred leaf. When you hold the rolled leaves (a cigar) you never use your two fingers like scissors as it blocks the sacred energy, or your first finger and thumb, but the whole hand with all four fingers along the roll. You bite, not cut, the end you will draw from. You use the smoke as you inhale it in to cleanse and purify your thoughts and words and resolve that only pure truth – yours- will leave your lips as it is spoken straight from your heart. As you draw the tobacco in, you sit in silence for a few moments circulation the smoke around in your mouth and taking it deeper into your throat if you wish, then take time to reflect before speaking. When it is your turn to take the smoke, you only ever hold the burning end of the rolled leaves towards yourself, never pointing it at another person, this way it warms and honours your own heart before speaking. Once you have decided to speak, it must be an intention, or a reflection which honours your soul and that of everyone in the group. Then you pass on the tobacco roll to the next person around the circle. Once each of us had shared the sacred tobacco, our thoughts and our deepest emotions it was time to stand, hold hands, chant in a continuous Aum until it stopped naturally, and then dance in a circle. Whilst all this was going on her two gorgeous little children aged two and five had stripped off their clothes and painted themselves in bright green paint from top to toe and dancing amongst us looked like two little forest sprites. Wonderful! What a ceremony. What a day.